The Coachman Pastiche 460/2 is a luxury 2-berth caravan built and fitted out to make your experience of holidaying in it as smooth as possible; but without compromising on comfort and style. It has many new exterior features that add to its quality modern look such as the stainless steel grab handles and smart acrylic capped ABS front, as well as many new interior features such as clever yet tasteful storage and luxurious fittings that make the 460/2 a dream to use. 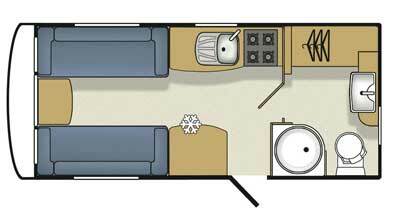 Image above is of one of the 4 berth models in the range but front shape is the same on the 460/2. 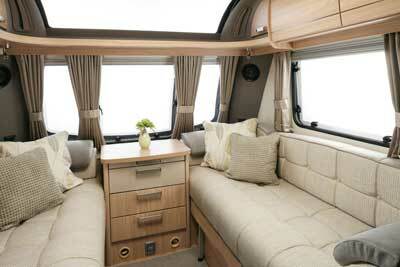 With a mixture of well-designed interiors such as the beautiful panoramic windows that compliment a good use of space; along with first class safety features such as the an AL-KO stabilizer and shock absorbers, this caravan is perfect for couples who value the style and elegance of touring without compromise. Although on the higher end of the price range for a 2-berth, on the market with a new list price of £19,995, it’s price does reflect the standard of caravan you will receive with attention to detail being a top priority, for instance with the lavish seating and back rests that accompany the lush carpets. Subsequently the Pastiche 460/2 is a quality made product, robust and designed to last; therefore with the delicately added touches, such as a high-end entertainment /DVD system and a fine-looking cocktail cabinet, something special is truly added to the overall aspect of the caravan. The Caravan in use Due to the new wider body shell at 7ft4” and thicker 45mm floor that aids with insulation the overall weight and size of the tourer is increased making it more substantial and therefore choice of vehicle should match this weight; a suggestion would be the Freelander 2 or something with the same pulling power. In the end the towing itself is flawless due to the aid of the AL-KO AKS 3004 stabilizer and shock absorbers, coupled with a spring-assisted handbrake, allowing for smooth and stress free towing experience. 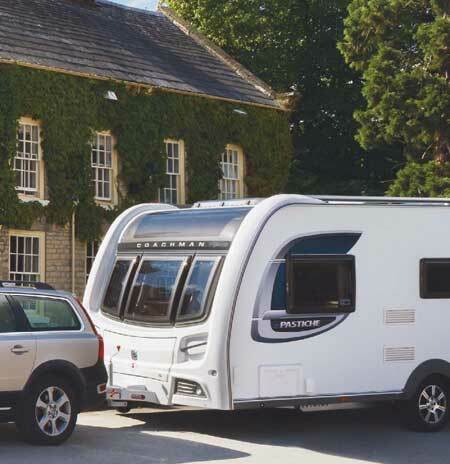 When arriving and setting up on site the Coachman Pastiche 460/2 has Stabilform heavy-duty corner steadies to ensure your caravan stays stable and level while in use. On the exterior you will find a mains socket and BBQ gas point ready for you to enjoy your days in the sun, with the added extra of an awning warmer to keep you warm if you decide to travel in the colder seasons; making this caravan a perfect choice for travelling in any weather condition. Upon entering the Pastiche 460/2 you will notice that the interior is finely designed, integrating panoramic windows on all sides and the ceiling to bring in light and make the caravan noticeably airy and spacious. To aid this spacious effect created by the windows, all of the interior furniture and paneling has been installed with a light oak wood effect, and the upholstery is pale and neutral, creating a modern simplistic tone. For daytime recreations the front area easily seats two people with room for guests, with a petite slide-out table and drawers perfect for sitting at for meal time, without taking up to much precious space. Other storage facilities in the 460/2 include: a large wardrobe, various cupboards situated around the kitchenette and dining area, with devoted table storage. In terms of entertainment the new Pastiche models include a top of the range Sony Entertainment centre with integrated CD and MP3 and DVD playback. The Pastiche 460/2 is fitted with a modern kitchen workstation that includes an extremely handy Spinflo Argent recessed stainless steel sink and draining board. The 113 litre refrigerator is a Thetford 3000 with a elegant curved door that allows you to conveniently store more food easily without compromising space in the kitchen area. Alongside this the chrome cup, plate, and utensil racks add a contemporary feel to the kitchenette area. When night falls the Pastiche 460/2 is ready to fulfill your needs with new beautiful LED lighting, and spacious bedding; with the front seats either converting into a double bed sleeping area or two handy single beds. In the washroom area the sink is fitted with luscious chrome taps, and a handy curved shower cubicle with a single piece sliding door to allow for the maximum ease and accessibility without causing a spatial inconvenience to the rest of the tourer. Also included in the washroom you will find a tasteful vanity cabinet to aid in the already vast storage capacity of the caravan. Overall the Coachman Pastiche 460/2 is a nicely designed and spacious high end 2-berth tourer, perfect for the a couple looking to treat themselves to a modern stylish caravan. The exterior is sleek and streamline, with an equally impressive interior that will remain full of style for years to come. It is pricey but you get out of it what you are willing to give: and in this instance you will get a top of the range product, that makes the most out of its space and design for a wonderful touring experience. If you feel that the Coachman Pastiche 460/2 isn’t for you, either due to your price range or other reasons, there are many other 2-berth tourers in the market that you can consider such as: the Elddis Xplore 302 starting at prices around £10,999, a small and extremely lightweight option for those without the vehicles for a heavier caravan.